The Kingsway is an affluent residential neighbourhood in Toronto, Ontario, Canada. It is located in the former City of Etobicoke, an area that became the west end of Toronto upon amalgamation in 1998. It is bounded by Bloor Street to the south, Dundas Street to the north, the Mimico Creek to the west and the Humber River to the east. While the area was first known as "Kingsway Park", popular usage drifted to "The Kingsway", that being the name of the main road which winds through the heart of the area. "The Kingsway" is also the name of the Business Improvement Association business district along Bloor Street. Along with The Bridle Path and Forest Hill, Toronto, The Kingsway is one of the most affluent areas in Toronto and homes are characterized by large stone mansions of English style. The 2012 average price of a detached house was $2,931,065. The mandatory 2006 long form Census found that 535 homes are owned (Source: Statistics Canada, 2006) and the 2011 voluntary National Household Survey returned similar results as it was determined 520 homes are owned within the tract (Source: Statistics Canada, 2011). The number of homes that are owned drastically outnumbers the number of homes being rented. In 2006 it was found that eighty-five homes were being rented in Census tract 0227.00. 2011 saw a small rise in this number and the National Household Survey determined that ninety-five homes were being rented. For planning purposes the neighbourhood is known officially by the City of Toronto as "Kingsway South" to differentiate it from a more recent extension of The Kingsway north of Dundas Street. "Kingsway South" does not enjoy popular usage owing to confusion with the South Kingsway, a busy street located east of the Humber River and extending south from Bloor Street. The neighbourhood is predominantly residential with a mixed-use (commercial and residential) area along Bloor and Dundas Streets. The majority of the housing stock is single-family detached homes. There are apartment and condominium buildings near the Old Mill subway station, as well as in mixed-use buildings along Bloor and Dundas Streets. A rail line runs through the north-west quadrant of the neighbourhood. Parkland lines the banks of the Humber River and Mimico Creek. The Gamble's store was situated in the community of Lambton Mills, on the west side of the Humber River, south of Dundas Street, 1893. The first area to be built on was south of Government Road, east of Prince Edward Drive which formed the government 'King's' Mill Reserve; a large forested area with the 'Old Mill' at the centre, on Bloor beside the Humber River. This part of the modern Kingsway, now centred on the street 'The Kingsway', was the least developed area until the neighbourhood was subdivided; it is now the most exclusive (and leafy) part of the Kingsway as well as its namesake; the street 'the Kingsway' beginning at gates beside the Old King's Mill. 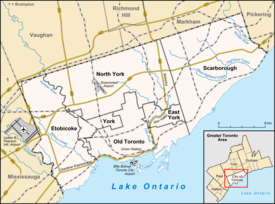 Along Dundas from the Humber River to Royal York was the Etobicoke side of York Township's community of Lambton Mills. With a second mill on the western (Etobicoke) side, this area was the first to develop but is today the least affluent part of the Kingsway. South of Bloor, west of Prince Edward Drive formed a typical farming community dominated by the Thompson family; sometimes called 'Thompson Estates' by local developers. Today this community is only slightly less affluent than the former Kingsmill, although picturesque along the Mimico Creek which winds through the former Thompson farms. One of the two Thompson homes, Spring Bank Cottage', survives facing Royal York at the top of the hill overlooking Mimico Creek. An advertisement for residential development by Robert Home Smith & Company, 1930. Smith designed The Kingsway in adherence to the principles of the Garden city movement. The neighbourhood was first developed by Etobicoke lawyer Robert Home Smith who purchased the old King's Mill (which was renamed the Old Mill, reopening as a high-end Inn) and began developing land in the early 1900s. The Kingsway emerged from Home Smith's vision of the ideal community and was mostly inspired by the Garden City principles, which were originally conceived in parts of England and the United States during the late 19th and early 20th centuries. Indeed, Smith was a big fan of everything English, and this inclination instructed his ideas for the neighbourhood. By the 1920s, those ideas culminated into the development, which he named Kingsway Park. "Tastefully appointed" traditional homes were sited on well-treed and winding streets, to create an air of a wooded retreat. Home Smith also decreed that no owner could build a house without the approval of his staff, and he developed strict regulations against the cutting of trees. Most of the homes were designed in the Arts and crafts style, which had become popular during that time. Smith insisted on the use of locally sourced materials for the houses in Kingsway Park, such as sandstone quarried from around the Humber River and Credit River areas. Kingsway Park was aimed at affluent home buyers. Street names such as Queen Anne Road and Kingsgarden Road emphasized the appearance of English respectability and affluence that Smith was selling. Smith also created the Old Mill Restaurant in the community, whose Tudor Revival facade and well-appointed interior inspired much of the English design in the Kingsway. Despite its well-intentioned approach to traditionalism, the Kingsway was a neighbourhood built for the automobile, and all houses were built with discreetly placed garages, as per Smith's wishes. The Kingsway Theatre was reopened on 1 January 2009. In the 1950s a series of accidents led to the creation of a highway style interchange at Royal York and Dundas, cutting the neighbourhood from the much older community of Islington to the west and the street 'The Kingsway' from its extension to the north. Consequently, the neighbourhood along the Kingsway north of Dundas developed in a radically different way than that to the south had done. The stretch of Bloor east of Prince Edward Drive near the entrance to the street 'the Kingsway' and the Old Mill saw the construction of many apartment buildings in this period. The community in the Kingsway has been very successful in preserving the style of housing and atmosphere of the neighbourhood as intended by Robert Home Smith; the area contains many of Etobicoke's most prestigious addresses. The Kingsway Theatre is an independent privately owned and operated business. It is not a community theatre and not dependent on charity. The Kingsway Theatre was reopened on 1 January 2009 by Rui Pereira and has been fully renovated. Royal York station is a subway station located in The Kingsway. The area is served by the Royal York and Old Mill TTC subway stations. The 73 Royal York and 48 Rathburn buses run north from the Royal York station. The 66 Prince Edward bus line run north and south from the Old Mill station. Bloor Street is the southern boundary of the neighbourhood and also a major east-west arterial roadway and commercial district. Prince Edward runs north-south from Berry Road to Dundas Street West. It is a two-lane arterial roadway. The Kingsway road is a two-lane road beginning in the south-east corner of the neighbourhood extending northerly in a north-west direction past Dundas Street. Dundas Street West is the northern boundary of the neighbourhood and also a major east-west arterial roadway. There is some commercial and institutional uses along the roadway within the neighbourhood. Etobicoke Collegiate Institute is a secondary school in The Kingsway. Two public school boards operate schools in The Kingsway, the Toronto District School Board (TDSB), and the Toronto Catholic District School Board (TCDSB). The TDSB operates one secondary school in the neighbourhood, Etobicoke Collegiate Institute. The secondary school was established in the fall of 1928 and is the first and traditionally central school for Etobicoke. Lambton-Kingsway Junior Middle School is a public elementary school on Prince Edward Drive, close to the intersection of Dundas Street West and Royal York Road. The present building opened in January 1993. Our Lady of Sorrows Elementary School is a Catholic school situated on Montgomery Road near the intersection of Bloor Street and Royal York Road. Established in 1942 out of Etobicoke's oldest parish, Our Lady of Sorrows Roman Catholic Church, Kingsway. Our Lady of Sorrows once served much of the then largely rural, Etobicoke until post war urbanisation led to the creation of many new parishes to the north. Our Lady of Sorrows is now a feeder school for Bishop Allen Academy. The original school building was demolished from 2001 to 2002, and in 2003 the new school building was completed. Bishop Allen Academy is a Catholic high school located on Royal York Rd. In addition to public schools, The Kingsway is also home to Kingsway College School, a private school affiliated with the Anglican Church, located at 4600 Dundas Street West. Home Smith Park is a municipal park located in The Kingsway. Kingsway Movie Theatre Restored by Rui Pereira - The Kingsway Theatre operates daily with matinees and evening shows - playing recent releases and first run films. ^ "Our Lady of Sorrows Catholic School". Toronto Catholic District School Board. 2018. Retrieved 15 November 2015. ^ "Kingsway College School". 2018. Retrieved 15 November 2015. Wikimedia Commons has media related to The Kingsway.